The following is a true account of said author's recent experience in southeast Georgia. The tension was palpable as I made my way out of the danger zone, followed by a great multitude of survivors, an army in their own right, fighting for life. Thump, step, step. Thump, step, step. The sound behind me grew deafening as everyone followed me out the exits to safety. What treacherous venture have I gotten myself into this time, I wondered, racing past the residents of this south Georgia nursing home. A panicked staff shooed us toward exits with urgency, evacuating everyone in the building. Heading out the doors, I crossed the parking lot, surely just in the nick of time. I know, you're probably wondering why I didn't stop to help others to safety. Think about it. It would be right if we all died! 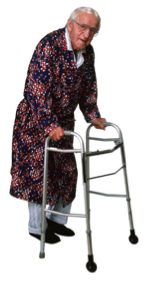 These elderly folks pushing walkers out the door were moving slower than molasses on cold cement. And there were too many of them for me help to safety. Besides, if I got killed, who would be there to assist the remaining survivors? This wasn't a time for hasty bravery, abandoning the greater good for a quick burst of heroism. No, this premeditated move was thinking under pressure at its best. "Does anyone know what's going on?" I dared to speak up once I reached safety. It was a bold move considering few could hear. "Oh it's just our semi-annual bomb evacuation rehearsal," one helpful nurse volunteered. "State requires us to do at least two evacuations a year to comply with safety regulations." As I sat there on the asphalt parking lot among the throngs of waiting residents, propped by their walkers and wheelchairs, melting in the hot Georgia sun, I marveled at the thought. A bomb drill…in a nursing home. If I was a terrorist, that's where I'd start—in the nursing homes of America. Terrorism at its best, I tell ya! I could clearly see the headlines, "Terrorists Take Over World in Nursing Home Plot." It's a brilliant plan. Revolutionary, even. What a way to go for the Achilles heel of our country! We'd be incapacitated in the worst way. Now don't think for a second that I'm saying that the surviving parents of our senior citizens are not important or even that they're dispensable. That's not my point whatsoever. All I'm saying is that I think the government has gone overboard this time, worrying about terror aimed at the aged. It's like, let's think up the most ludicrous thing possible, and start worrying it might happen. Let's give those elderly folks something else to obsess about in their last few years on earth. The next time you're out driving past a nursing home, and you see all the residents are scattered over the parking lot, pay attention. There just might be a terrorist lurking in the shadows, getting ready for a takeover. A very interesting article – thanks! I was about to forget searching for this info, but luckily, this was the last page I Googled LOL. Informative story, saved your website in interest to see more information!